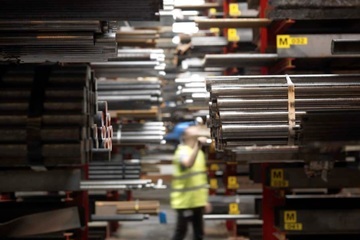 Dedicated / consignment stocks are one of the tools Hillfoot use to help manufacturers improve reliability in their supply chain and simplify the process of ensuring the specialist steel grades they need are available when they require them. One of the biggest challenges facing every manufacturing business is balancing the ability to quickly service their customers’ needs with inventory levels and working capital. For engineering businesses using carbon and alloy steels these challenges become even greater due to the relatively long lead times from the major steel producers. Having a robust and efficient supply chain is therefore vital for these companies to allow them to grow and attract new business whilst ensuring they control costs and deliver a quality product, on time, to their customers. At Hillfoot we have worked with our customers for many years to develop supply chains to tackle these issues. With our buying power and long-term relationships with many global steel mills we are able to offer cost-effective supply solutions tailored to our individual customer’s needs. With capacity to stock over 10,000 tonnes on site and a dedicated logistics service offering next day deliveries throughout the UK, this gives our customers the support to react quickly to meet the demands of their markets. Contact our sales team for more information about Hillfoot’s dedicated / consignment stock service and how it could work for your business.